From mega wind purchases to rooftop solar arrays to electric truck orders, companies of all sizes are stepping up to act on climate. When President Trump announced plans to withdraw from the Paris climate accord attention quickly turned to corporate America. Would business leaders forge ahead in the fight against climate change in the absence of federal backing? In 2017, at least, the answer is yes. 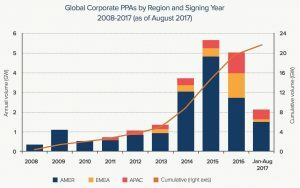 As of December 12, when heads of state joined to commemorate the second anniversary of the Paris Agreement, 327 major corporations, worth a cumulative $6.5 trillion, had committed to matching their emission reduction plans with the Paris goals through the Science Based Targets initiative. 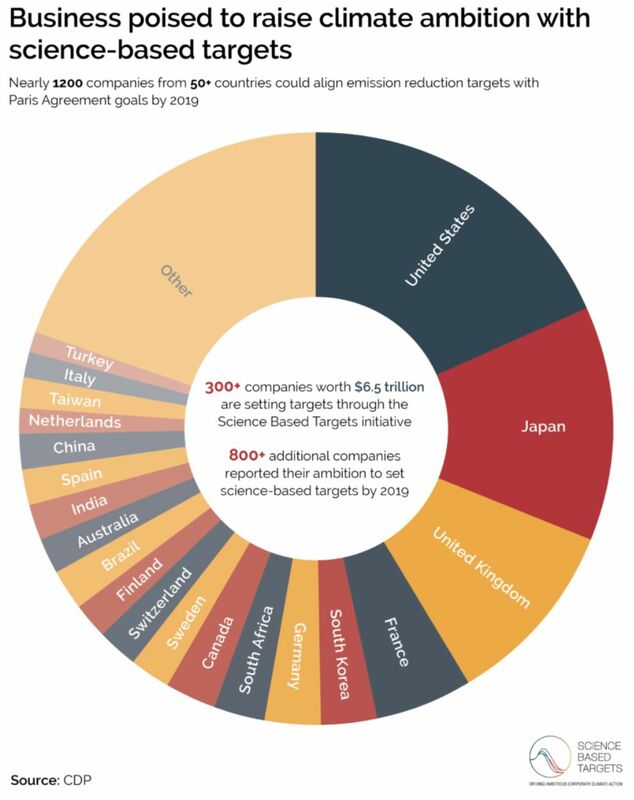 Another 864 companies have stated their intention to adopt a science-based target within two years. These companies hail from some 50 countries and 70 sectors, including finance, chemicals, food processing, technology hardware and more. Companies headquartered in the U.S. make up 20 percent of the group and have made the greatest number of climate commitments to date, despite uncertainty surrounding the American government’s participation in the Paris accord. In addition, some 1,700 U.S. businesses from every state and of varying sizes — from Walmart to Wild Joe’s Coffee Spot in Bozeman, Montana — have signed the “We Are Still In” declaration. The initiative, which also includes cities, statehouses and college campuses, was intended to demonstrate America’s enduring commitment to delivering on the promise of the Paris Agreement. Apple, for instance, issued a $1 billion green bond in June, shortly after Trump announced his exit from the climate deal, which CEO Tim Cook tried to convince the president not to quit.This is the tech giant’s second green bond, following a $1.5 billion offering that came in response to the Paris Agreement last year. Proceeds from the green bond sales will be used to finance renewable energy and energy efficiency projects at Apple facilities. In another significant development this year, Walmart launched Project Gigaton, which asks its suppliers to reduce their greenhouse gas emissions by 1 gigaton by 2030. That amounts to the equivalent of taking more than 211 million passenger vehicles off of U.S. roads for an entire year. Walmart is “bypassing the politics” to focus on driving down emissions internally and in its supply chain, said the company’s Chief Sustainability Officer Kathleen McLaughlin, speaking at the New York Times’ ClimateTECH conference in late November. There is a business case for supporting sustainable agriculture, combating deforestation, reducing waste and purchasing renewables, she said. Cost savings is one, but there’s also the potential for business-model innovation, improved product quality and increased sales revenue. As part of their climate action plans, 119 companies have committed to sourcing renewable energy for 100 percent of their operations through the RE100 initiative. That’s up from 56 members a year and a half ago. Schneider Electric is the latest company to commit to 100 percent renewable electricity through RE100, with a 2030 target date. The European multinational also pledged to double its energy productivity by 2030, from a 2005 baseline, through an initiative called EP100. Other recent additions to the RE100 list include Estée Lauder, Kellogg, DBS Bank and Clif Bar. Citi Group also made the 100 percent renewables pledge in September, on top of the company’s vow to finance $100 billion in clean energy, infrastructure and technology projects. 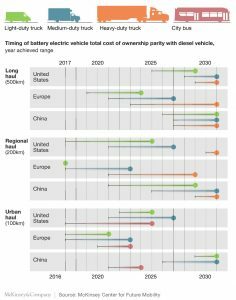 Meanwhile, French utility EDF Group recently committed to transitioning to electric vehicles by 2030 through EV100, a new initiative that seeks to make electric transport “the new normal.” All three initiatives — RE100, EP100 and EV100 — are led by the international nonprofit organization The Climate Group. 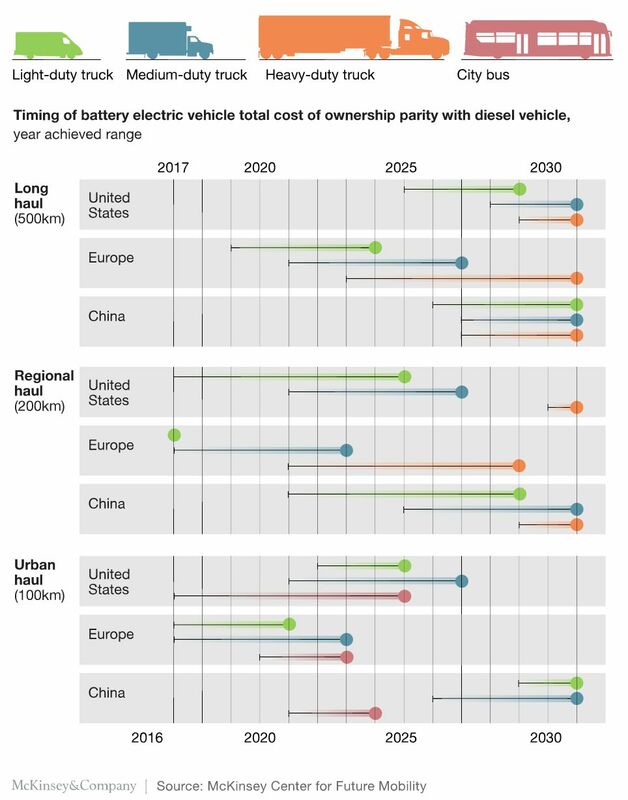 The increasing cost-competitiveness of lithium-ion batteries has made electric trucks, and shorter-haul vehicles in particular, an attractive investment for many companies. UPS, for instance, currently owns 120 electric trucks in the U.S. and more than 140 of them abroad. In New York City alone, UPS is planning to convert up to 1,500 tucks to EVs by 2022. To support its electrification goals UPS recently placed advance orders for the newly introduced Tesla Semi. PepsiCo, Walmart and several others have also preordered the Tesla truck, which is scheduled for delivery in 2019. It took Walmart a decade to double the fuel efficiency of its trucking fleet in an attempt to reduce fossil fuel use and cut costs, but the company still uses an enormous amount of fuel, said McLaughlin. The company is excited to pilot the Tesla Semi and other electrified platforms because “we envision a world where our fleet is run completely on renewable energy and we think this is an exciting step that allows us to experiment with that,” she said. With electric trucks either on the market or expected from manufacturers such as BYD, Daimler, Volvo, Tevva Motors, Chanje and several others, corporate customers will soon have lots of options to buy electric. The rise of electric trucks coupled with exponential growth in the number of passenger EV models has made a campaign like EDF Group’s commitment to EV100 achievable. EDF hasn’t only been active on cleantech internally. Like many other energy companies, EDF has also played a growing role in serving others in the corporate sector this year. In late November, EDF Renewable Energy, a subsidiary of EDF Group, announced a deal to supply Google with 200 megawatts of wind energy generated from the new Glaciers Edge Wind Project in Iowa. Glaciers Edge is the third deal EDF RE has done with Google, and it is expected to come on-line in December 2019. 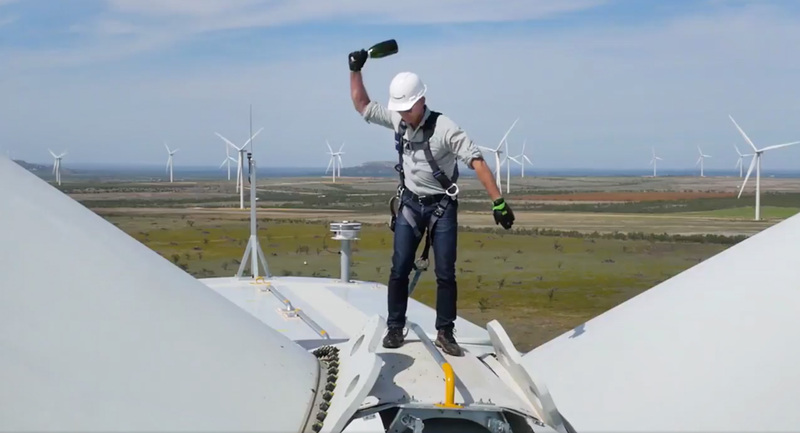 Once complete, the wind farm will help Google reach its goal of purchasing enough renewable energy to match its consumption for global operations. Google also signed agreements in recent weeks for wind-generated electricity from Avangrid’s Coyote Ridge and Tatanka Ridge wind farms in South Dakota, both of which are 98 megawatts, as well as 140 megawatts from the 300-megawatt Red Dirt site in Oklahoma. The cumulative 536 megawatts Google purchased from U.S. wind farms in November puts the company’s total renewable energy procurement to date above 3 gigawatts. 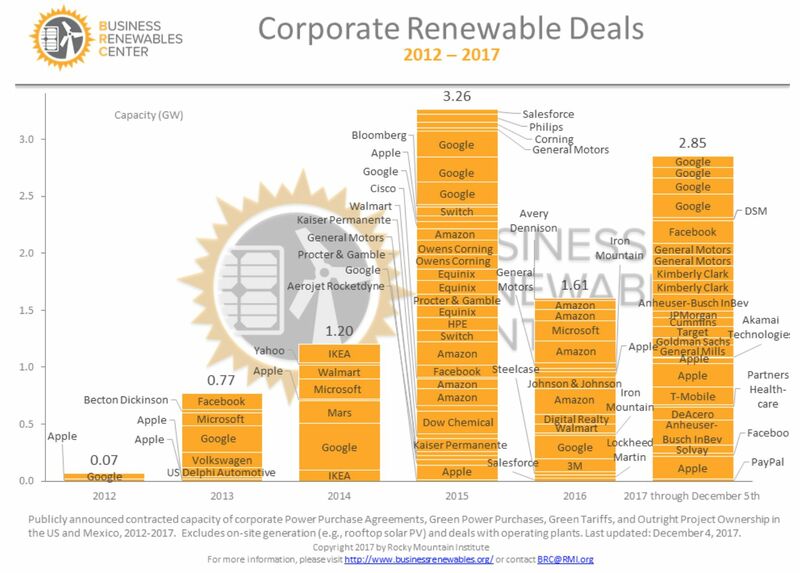 These wind deals are just the latest in a long list of corporate renewable energy procurements this year. 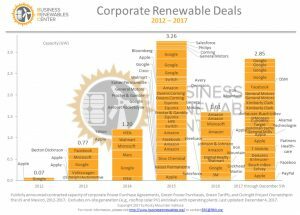 While 2017 won’t be record-breaking, it will be the second-best year for corporate renewable deals, according to the Rocky Mountain Institute’s Business Renewables Center. Notable deals include Anheuser-Busch’s virtual power-purchase agreement with Enel Green Power for 152.5 megawatts of the 298-megawatt Thunder Ranch wind farm in Billings, Oklahoma. The renewable energy produced under the PPA is equivalent to meeting 50 percent of Anheuser-Busch’s total electricity needs in one year, which is enough renewable electricity to produce more than 20 billion 12-ounce servings of beer annually. The Anheuser-Busch agreement marks a significant step toward delivering on parent company AB InBev’s global commitment to secure 100 percent of purchased electricity from renewable sources by 2025. JPMorgan Chase, which recently committed to facilitating at least $200 billion in clean financing over the next eight years, signed a 20-year PPA with NRG for a 100-megawatt wind project this year as part of the bank’s commitment to cover all of its power needs with renewables by 2020. While JPMorgan does not disclose how much power that amounts to, it will have to cover the real estate footprint of more 5,500 properties in 60 countries. To reach that goal, the company is also evaluating on-site solar options on up to 1,400 bank-owned retail buildings and 40 commercial buildings worldwide. At the same time, America’s biggest bank is cutting energy use at its 4,500 U.S. branchesthrough the use of new energy management and digital technologies. Chase is partnering with GE’s Current to install sensors, software and lighting controls that will help bank branches reduce electric and gas consumption by 15 percent. The company also continues to offset 100 percent of emissions generated by employee air travel on an annual basis. Collectively, these actions put JPMorgan Chase on track to reach its goal to reduce greenhouse gas emissions 50 percent below 2005 levels by 2020. Kimberly-Clark also made some big commitments to clean energy in 2017, with the corporation’s first major renewables agreement to buy 245 megawatts and 1 million megawatt-hours of electricity from two new wind projects in Texas and Oklahoma. In October, Amazon made a splash with its largest wind farm announced to date. Industry giants with household names are currently leading the way with renewable energy purchases, but the corporate clean energy market is starting to diversify and appeal to smaller players. “The next frontier of corporate purchasing is for corporate buyers with smaller appetites to increase their renewables contracting in a meaningful way,” said EDF’s Susman. Expanding markets to these smaller players has proved to be a challenge, however. In an interview earlier this year, Patrick Flynn, director of sustainability at Salesforce, pointed out that in the commercial renewables sector “growth is driven by a handful of large, experienced corporations” and the top priority should be to “lower barriers to entry” for other companies. While many companies are choosing to bypass federal politics to act on their climate agenda, policy innovation at the state and local level continues to be critical for the commercial renewables sector. That’s true for companies of all sizes, but it’s especially so for smaller businesses that are more price-sensitive. In regulated markets, utility green tariff programs are an emerging option for corporate customers. As of September, 17 green tariffs in 13 states have been proposed or approved since NV Energy put forward the first green tariff in 2013, according to the World Resources Institute. Green tariffs come in different forms and flavors. Puget Sound Energy, for instance, launched the first subscriber-style green tariff to be used by retailers and small governments in April. While most existing green tariffs are designed to enable a single, new and very large customer to contract for an entire renewable energy project, PSE’s Green Direct program allows existing customers to contract for a more modest portion of a big clean energy project, which could enable smaller corporate players to participate. In North Carolina, a July law reintroduced a Green Source Rider Program that allows corporations, the military, and the University of North Carolina to purchase renewables. The same law, HB 589, also legalized third-party leasing of renewable energy systems, which could be a viable option for the business community. If companies don’t get the policy arrangement they want, regulated utilities risk losing corporate customers. Pressure from large corporate buyers is spurring utilities in the heart of coal country to find renewable energy solutions — despite President Trump’s calls for a coal renaissance. In Nevada, casinos such MGM and Wynn Resorts are leaving the grid to buy clean energy from outside suppliers, and now the state is considering deregulation. Other parts of the country, a different set of policy solutions has cropped up. San Francisco Public Utility Commission’s CleanPowerSF program, for instance, helped Salesforce to source 100 percent renewable energy for its two office towers in San Francisco in August. In deregulated markets, where most clean energy deals have been done to date, corporate buyers have more flexibility in their renewable energy purchasing options. But even here policy remains central. In all states, renewable energy targets, net metering policies, utility rate schedules, permitting processes, government incentives and other policy elements affect how easy or hard it is for companies of various sizes to purchase renewable energy. After several years of policy uncertainty, Ohio’s renewable energy and efficiency mandates were officially reinstated late last year. This year, the issue cropped up again. In March, the Ohio House of Representatives passed a bill to make the mandates voluntary. The legislation has since been taken up by the Senate, and Senate President Larry Obhof has said he’ll advance the bill in January. Meanwhile, there’s an ongoing debate in Ohio around the need to subsidize coal and nuclear plants. “What both the advanced energy industry and healthcare providers would like to see from lawmakers is a move to put innovative technologies on a level playing field with some of the other incumbent technologies in the state, basically allowing competition to thrive,” said Ray Fakhoury, state policy associate at Advanced Energy Economy, which helped to facilitate the Ohio energy policy letter. Large companies like Kaiser Permanente and Partners HealthCare have made sizable investments in renewables in recent years, but healthcare providers have generally taken a cautious approach to renewables. There’s hesitancy to make the upfront investment when healthcare needs are so high and some concern around disrupting hospital operations during installation. But the sector is starting to see a shift. Because hospitals are the second most energy-intensive facility type in the U.S., renewables present a significant cost savings opportunity for the sector. Hospitals also need power around-the-clock and stand to benefit from clean energy microgrids in the event of an outage. Recent disasters such as the Boston bombing attack and Hurricane Harvey have underscored the need for uninterrupted electrical service at hospitals, according to a recent report sponsored by Ameresco. “We’re now seeing hospitals get involved [in renewables] in a more active way, because pushing for access to a diverse portfolio of resources is something they’re interested in and Ohio is a state they’re looking to,” said Fakhoury. Signers of the letter include the Cleveland Clinic, the Ohio Hospital Association Energy and Sustainability Program, and the CEOs of Mercy Health, Mount Carmel Health System, and Tri-Health. Energy business leaders signing the letter include executives from First Solar, Apex Clean Energy and Siemens. Of all companies, purchasing solar is the biggest challenge among the smallest players. Small and medium-sized businesses have traditionally been a “no man’s land” for solar installers. Between 2012 and 2016, commercial solar installations were virtually flat due to project financing challenges, lengthy development timelines and heavy reliance on incentives. According to GTM Research, commercial solar hit its highest year of installations in 2016 as the market experienced demand pull-in in response to two impending regulatory deadlines on solar-friendly rate structures came in California and the qualification period for obtaining the full SREC value in Massachusetts. These factors continued to drive deployments in 2017, but growth is expected to drop in 2018 and only grow incrementally over the next five years. Legal fees and complex contract negotiations create substantial transaction costs for commercial project developers and owners. Customer acquisition is time-consuming and highly localized. And attractive financing is only available to a subset of the market. Small and medium-sized businesses don’t enjoy the investment-grade credit that the Fortune 100 companies do. There’s still high interest in this market segment, however. Entities such as NextEra, NRG, AES and Duke’s REC Solar are active in the commercial solar space and competing to provide comprehensive low-carbon energy packages for customers. Commercial solar asset owners are also taking more control of their projects from the outset, rather than acquiring projects at a later date. Taking more control can eliminate speed bumps like having to repeat due diligence on project financing, according to GTM Research solar analyst Michelle Davis, author of the Commercial Solar Asset Ownership report. This trend could increase commercial solar installation volumes and concentrate the market beyond 2017. While there’s still a huge opportunity to tap into the commercial renewables market in the U.S., most of the larger, mature buyers are now starting to direct their attention elsewhere. According to the Business Renewables Center, North America accounted for more than 75 percent of global corporate PPAs through August 2017. But markets in South America, Europe and Asia have the potential for significant growth. A recent report by the Rocky Mountain Institute found that new opportunities for companies to use cleaner power in China could increase the country’s wind and solar capacity by 40 percent over 2016 levels by 2020. China is already the global leader on renewable energy deployment, but it currently offers few scalable options for companies to use 100 percent renewables. China is undergoing its most significant electricity reform in a generation, according to the report. As a result, the number of options for corporate buyers is increasing. In March 2017, for instance, the government established ground rules for community solar, opening a new mechanism to procure local power for companies without sufficient rooftop access. RMI identified eight other new and existing pathways to expand corporate renewable energy procurements in China. In some cases, policies and market dynamics in countries outside of the U.S. are better than those that exist within the U.S.
Walmart, for instance, has a goal to reach 100 percent renewables across its global network, and currently sits around 25 percent renewable today. But in the U.S., that number is actually closer to 12 percent, due to “the regulatory environment, pricing environment, infrastructure, technology and so forth,” said McLaughlin. Because large corporations have such large international footprints, they can’t afford not to lead on climate action or they could miss out on a business opportunity. The World Resources Institute identified three things company leaders can do push global climate action further in 2018: show up and speak up at high-level events, align their corporate climate goals with countries’ climate goals, and meet with ministers to help break down silos within and between governments, leading to a more cohesive policy framework. At the COP23 climate conference in November, U.N. Secretary-General António Guterres’ had a message for businesses: “I am asking you to misbehave.” He called for companies around the world to disrupt “business-as-usual” and urge governments to ramp up their climate action plans. Hundreds of businesses, in the U.S. and abroad, have accepted the secretary’s challenge. Now, the world will be watching for them to follow through.